scrubEx and alEx are the most advanced linen and scrub automated supply devices on the market. Using your existing hospital badges, control the supply of scrubs and linen by only allowing authorized staff and tracking inventory. 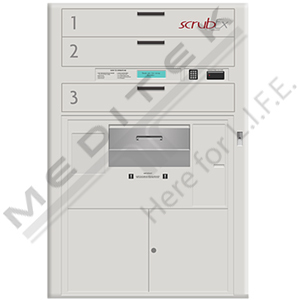 The worldwide leader in scrub supply automation, the scrubEx gives clean scrubs in the right size to your staff on an as-needed basis. Linen management proactively services the supply with real-time insight into inventory and utilization data. 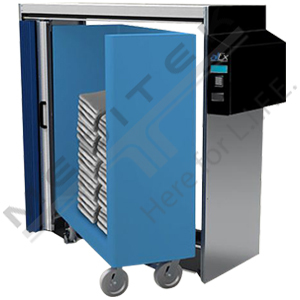 The system also facilitates infection prevention. scrubEx gives your staff peace of mind. With a dispense time of 2.1 seconds, it’s much faster than actively looking around for scrubs, and you get the right size everytime. Plus, by scrubEx reduces your scrub purchases by 90%. The worldwide leader in linen supply automation, the alEx provides clean linens to only the staff with authorized access. The system allows management to closely track and reduce loss. By always covering the linens, infection prevention increases. Hospitals using alEx have reported a 25% total linen cost reduction on average. Automatic alerts tell staff when levels are low, which increases efficiency and workplace satisfaciton.